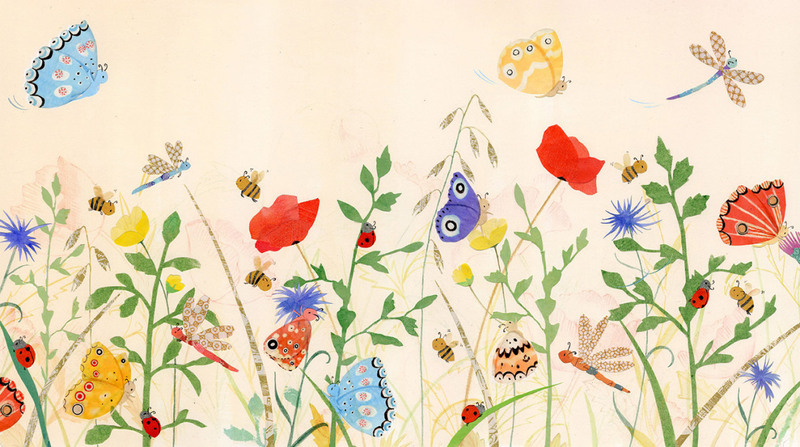 This post first appeared on Picture Book Den’s Blogspot. 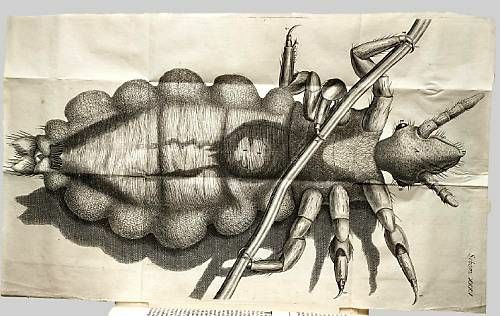 In 1665 Robert Hooke published a perspective-changing book of pictures, Micrographia. Looking through a microscope he could see further than anyone ever could before, and he showed us this tiny world of everyday things made enormous and wonderful, with huge fold-out pages. 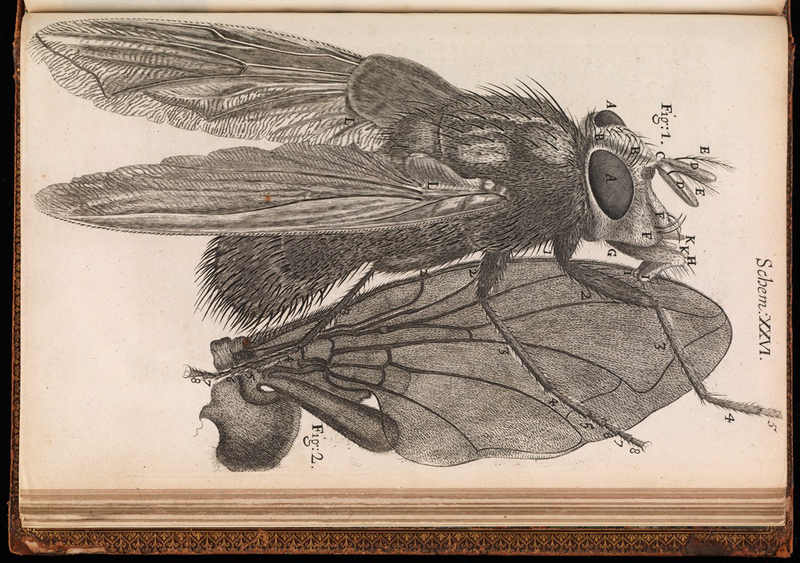 People were amazed by Hooke’s book – Samuel Pepys stayed up all night marvelling at it. 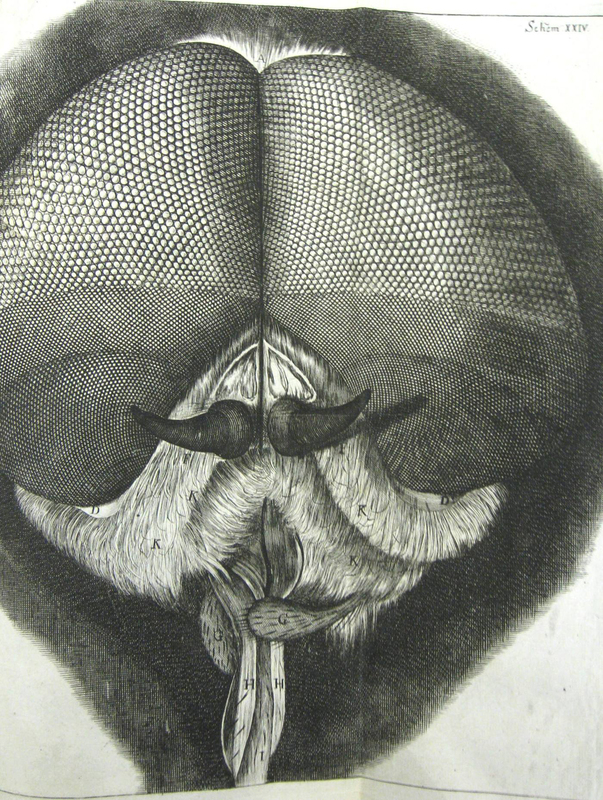 The everyday pest is revealed as beautiful; the flea is ‘adorn’d with a curiously polish’d suit of sable Armour’ and ‘multitudes of sharp pinns, shap’d almost like Porcupine’s Quills.’ Hooke also draws the mind-boggling face of a fly. And we find the insect face is hard to love. It doesn’t map that well onto the tetrapod look. It’s those mouthparts. 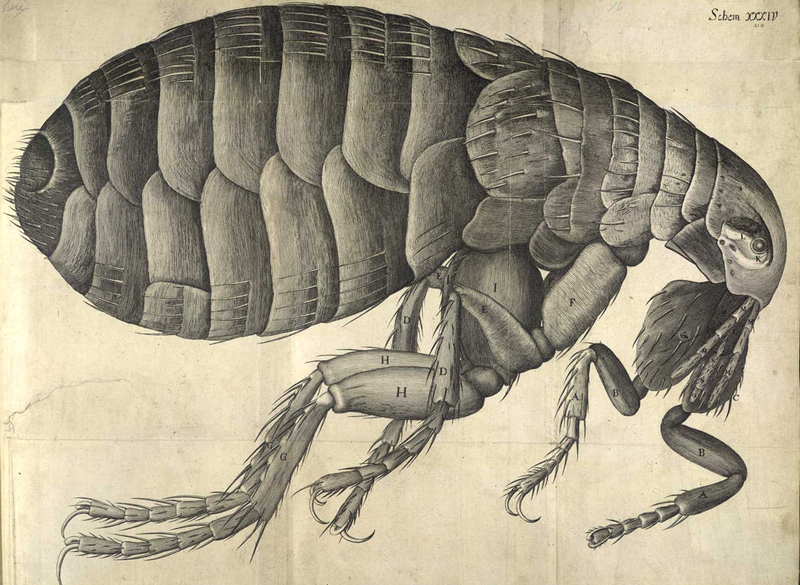 The flea has at least a nice moustache – but then – HELP! 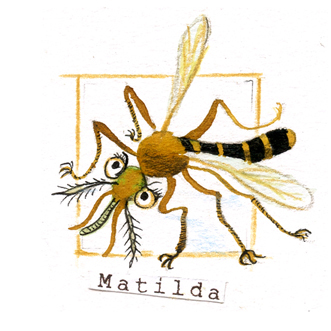 – it has a pair of legs growing out of its chin. Segments, exoskeletons and too many legs are also not ideal for building our empathy with arthropods. 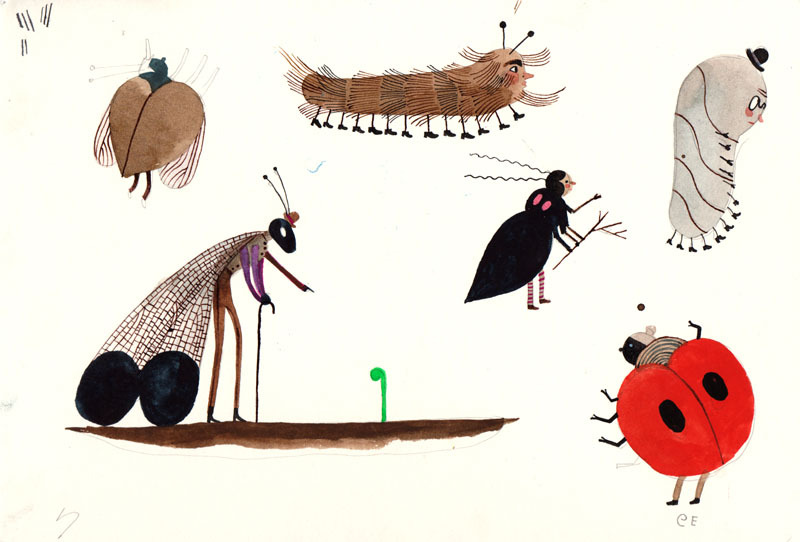 It is basic human behaviour to feel disgust at insects – no doubt due to instincts of self-preservation against contagion. Lots of insect life cycles are frankly disturbing – especially the parasitic wasps. 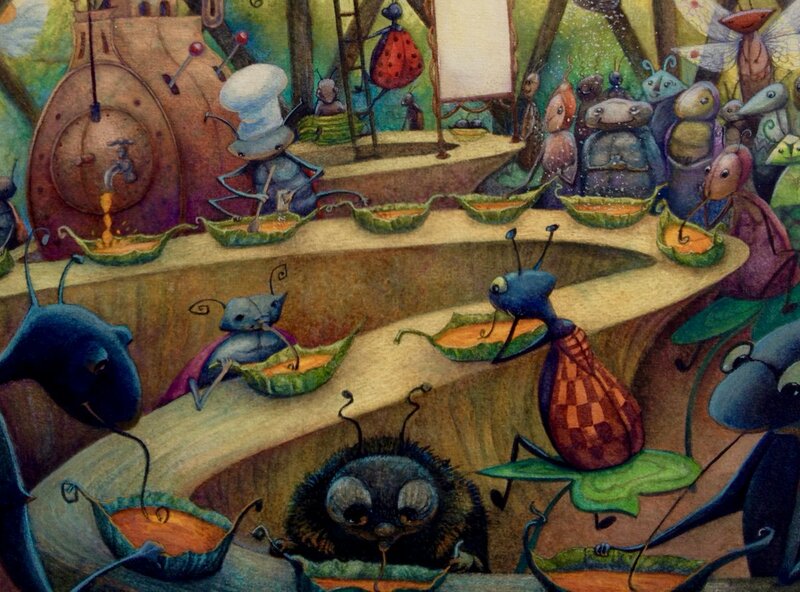 Most of human history has been a battle against innumerable critters out to infest you & contaminate YOUR FOOD. 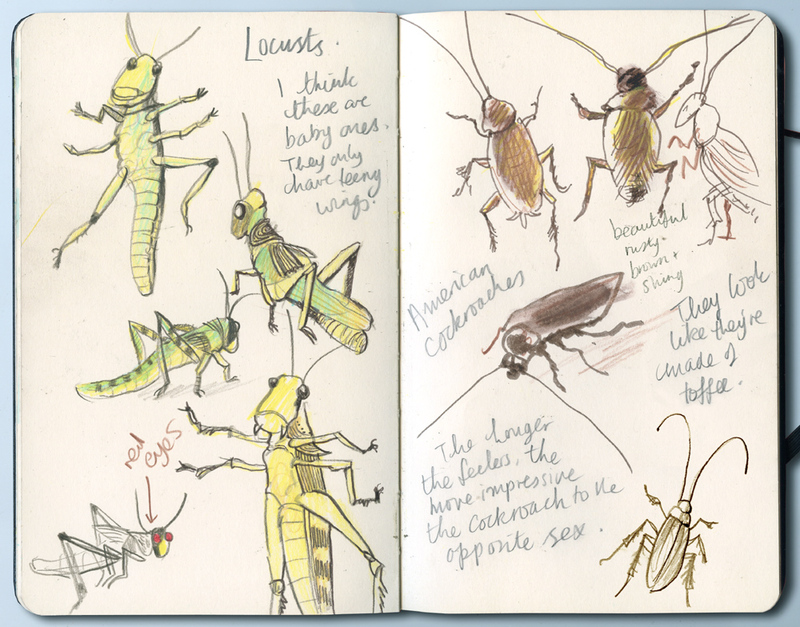 Here are some sketches of young locusts and cockroaches at London Zoo. But how does it feel to be an insect? Does it feel like something to be an insect? Some research seems to indicate that bees may experience different emotional states – emotions are useful for instigating behaviour – and it appears that dopamine plays a role in bee decision-making – as it does for us. It could be that emotions are essential for creating all behaviour so all animals that have behaviour are experiencing emotions – so life feels like something for all of them. No-one is a mindless automaton. 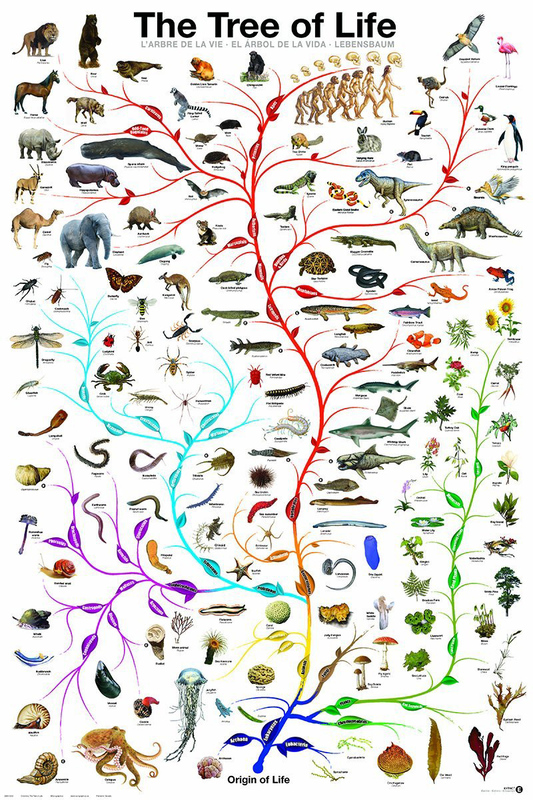 As fellow organisms on the Great Tree of Life, insects and us are related, but our branching apart is very distant. The Last Common Ancestor of us & insects was something Pre-Pre-Cambrian, something that maybe lived between 600 and 700 million years ago, and we share with it the invention of bilateral symmetry. 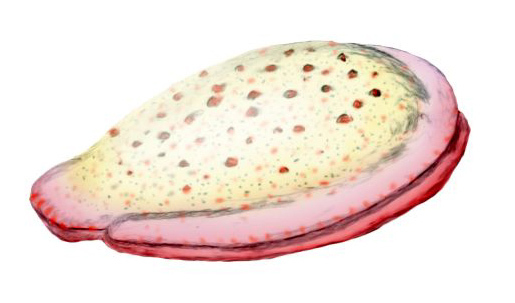 No-one has found that ancestor yet, so here is a Kimberella who might have been a bit similar, looking like a cross between a macaron, a sea-slug and a toasted cheese sandwich. 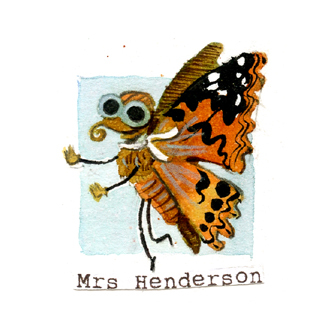 So, who has crossed over the human-insect divide (that empathy chasm) and involved insects in their picture books? Here are a few of my favourites. Do tell me yours! I remember having these little books when I was small. I found the small size and relatively large text quite exciting, especially as some words would be picked out in red. Here is Ant tucked up ill in bed. Here are some incredible geometrical cakes from when Ant and Bee go shopping. Where water meets willow two creatures meet. 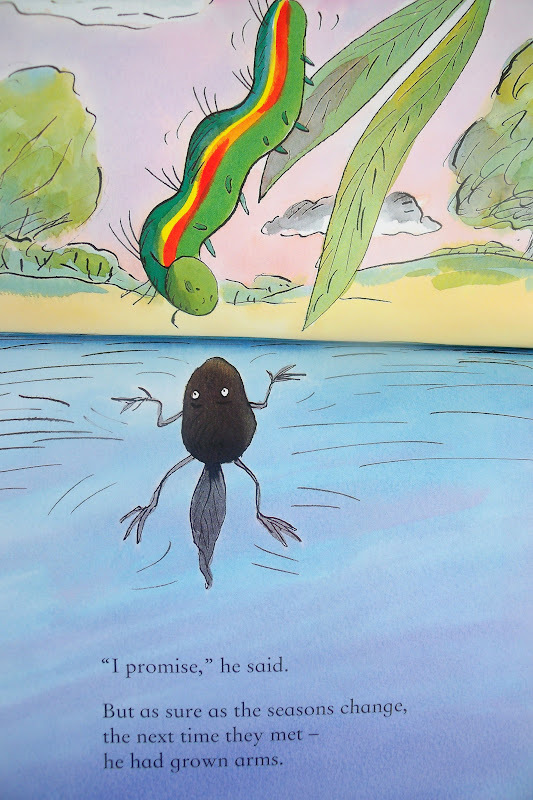 Using the page fold to show the intersection of air and water, amphibian meets insect and both must metamorphose. I am so glad that, as a mammal, I do not have to undergo this sort of utter transformation. 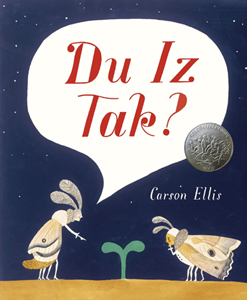 Du Iz Tak By Carson Ellis. 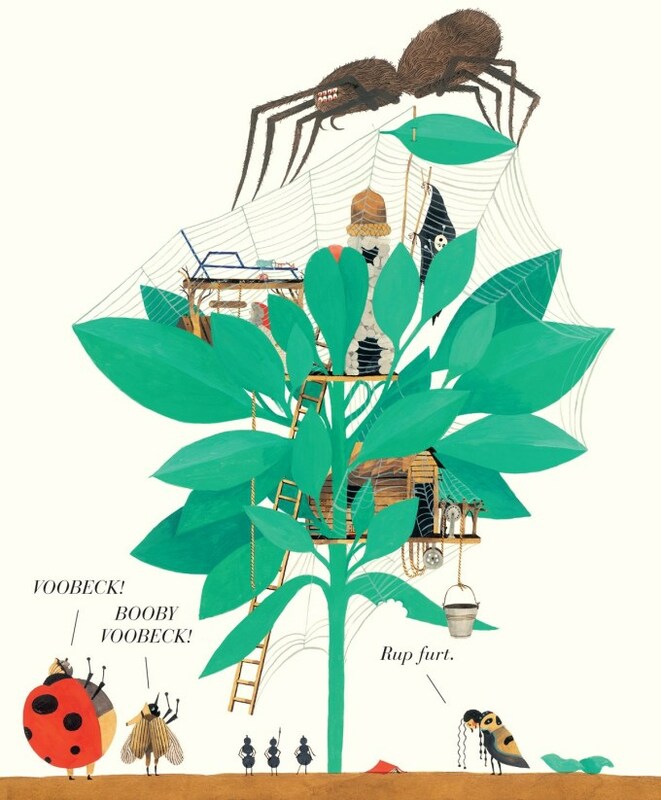 Insecty creatures find a shoot and tend it, building an extravagant plant house which gets beset by spider and bird, flowers and wilts. 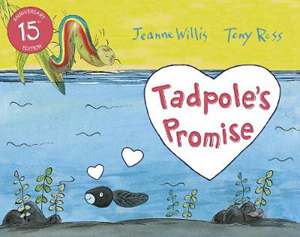 Like tadpole’s promise, the cast of insects are caught in the cycles of nature and changing seasons, but these ones end with new beginnings and lots of new shoots sprouting. 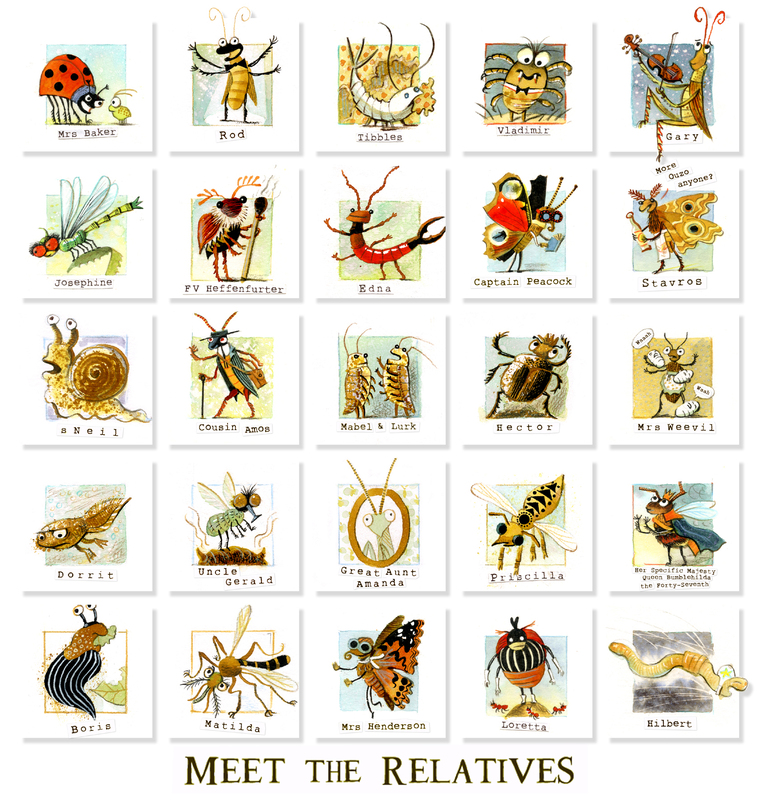 and the most friendly-and-engaging-ever critters here by Yuval Zommer. 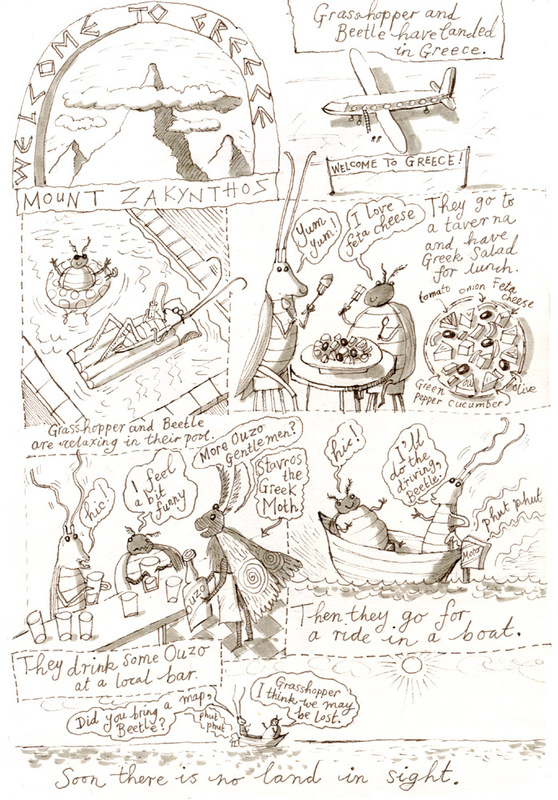 I wondered about a story for them; perhaps Grasshopper could be Don Quixote to Beetle’s Sancho Panza. 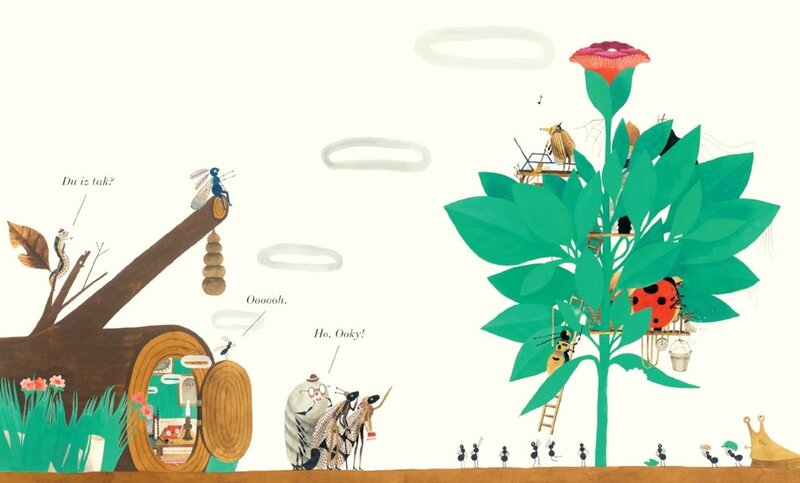 Maybe a Quest that takes place all in one garden, with the tiny insects travelling from one end to the other, beset with adventures and dangers. Well, as often happens, this didn’t really seem to work. But then I was asked to make some pieces for the John Radcliffe Hospital Audiology Department. The idea was to make something engaging and distracting for young patients, with lots of details to spot on repeat appointments. 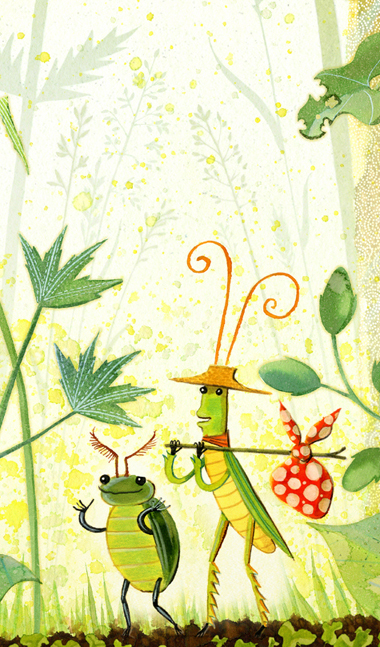 So I tried to turn Grasshopper and Beetle’s Garden Quest into a picture-story for a wall. 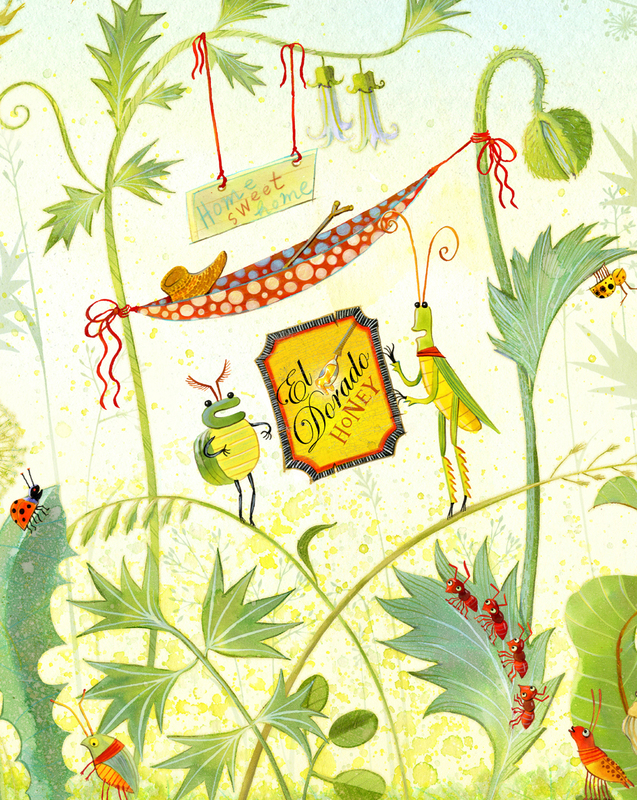 I thought I could make panoramas of a garden world full of minibeasts to spot. Playing around with tracing paper I wanted to make something multi-layered. It turned into three panoramas which really go from right to left down a garden (the opposite way to a book). 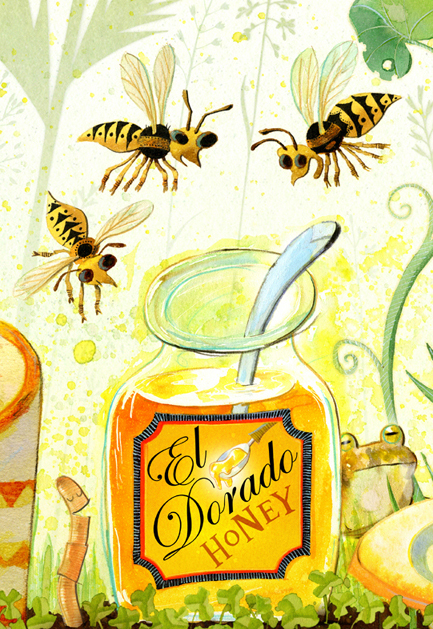 Grasshopper and Beetle find a label for El Dorado honey on the compost heap. 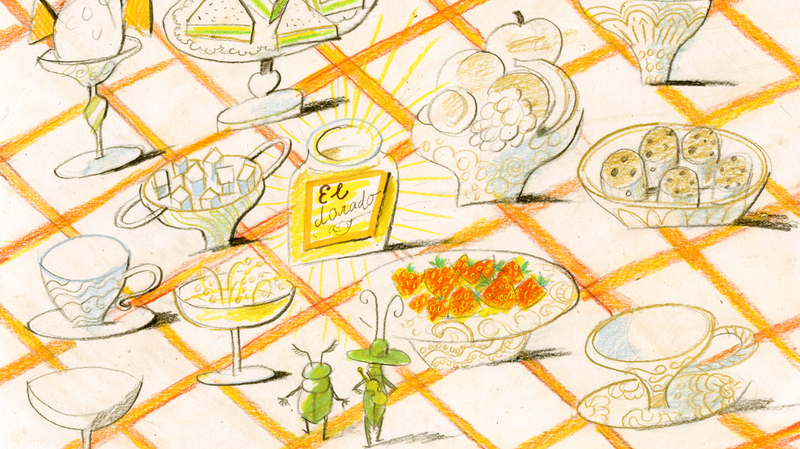 discovering a honey picnic under the trees. 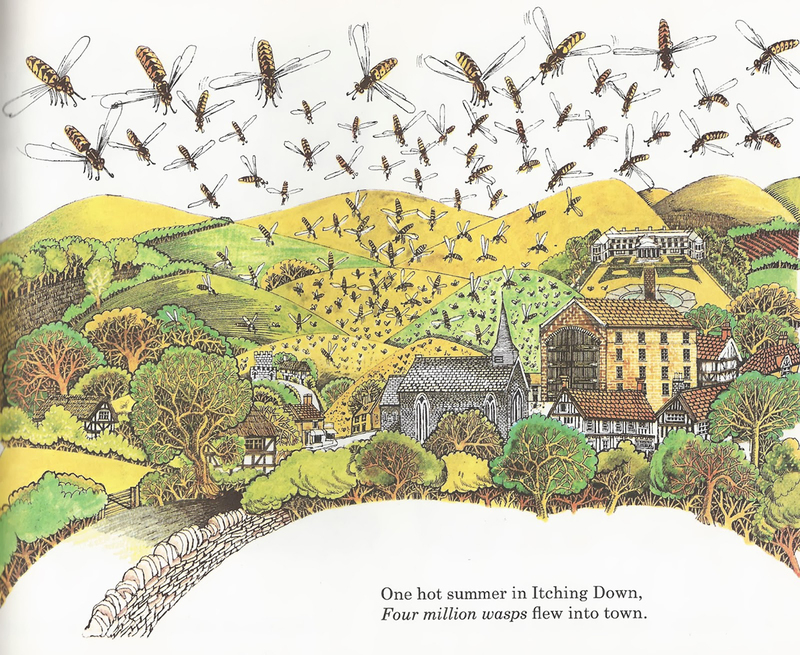 Nowadays there is grim news about insects from lots of fronts. 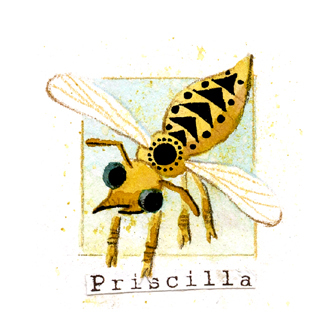 There has been widespread loss of pollinating insects across Britain in the last 40 years. 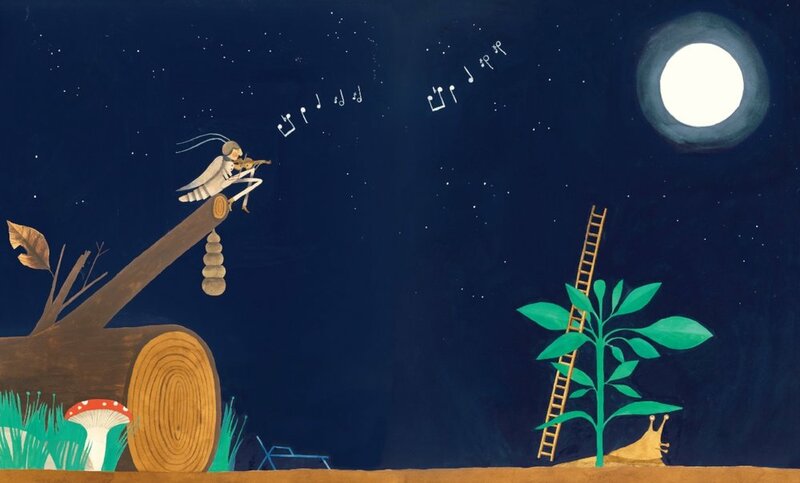 Insects are also at risk from shrinking habitat ranges due to climate change. There are shifting baselines and clean windscreens. Are we pulling out the Jenga bricks from the web of life? The tower gets rickettier, but it still looks like a tower until…crash! – one too many bricks has gone. It seems so much insect life is unmeasured, unrecorded, unknown. And that’s the stuff on land – what about the invisible areas we don’t even think about – under the ground, under the sea – ploughing either of those up is wrecking a world that is already there. 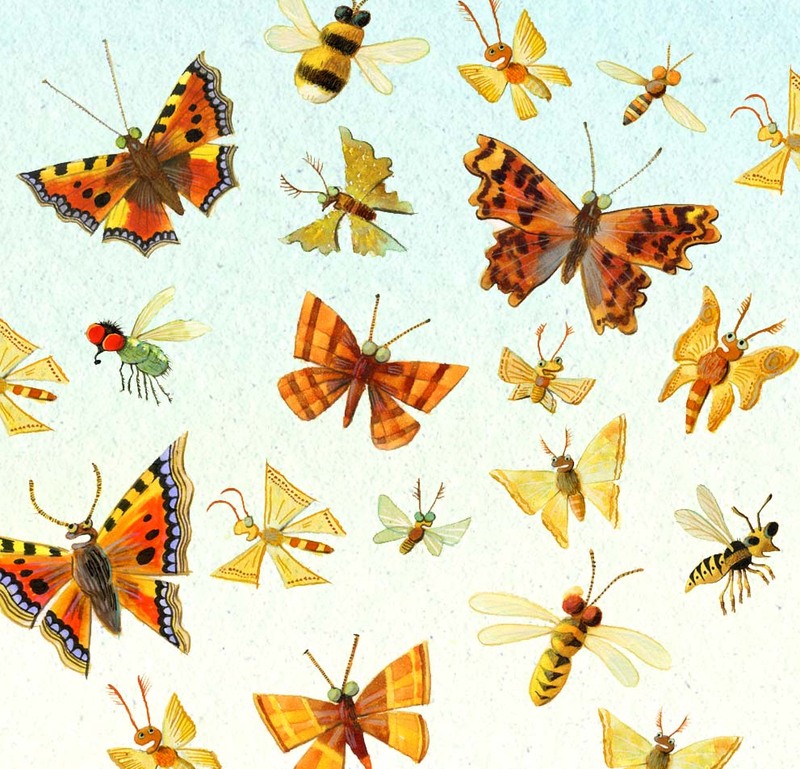 So what is causing the disappearance of insects? The causes, it seems, are: habitat loss, pesticides and climate change. What can we do about this? We can share our world with the wildlife in it! 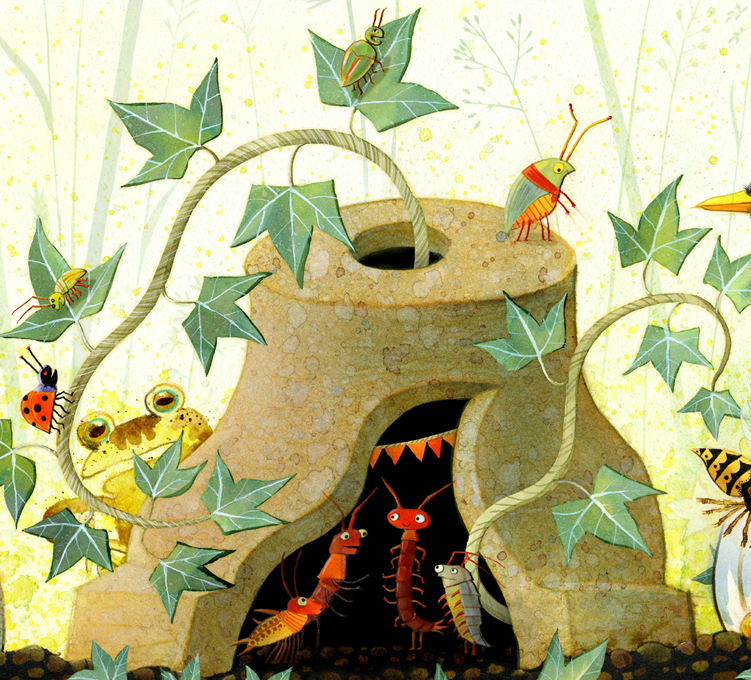 We can protect habitats: someone already lives there! We can set aside agricultural land margins and park margins for wild plants, as in this new law in Bavaria. We can treasure what we already have and make more. Edges and hedges and big trees are particularly good habitats…verges, parks, motorway margins, front gardens – all are opportunities for an edge habitat. We can make our edgelands into mini wildernesses, mini jungles. 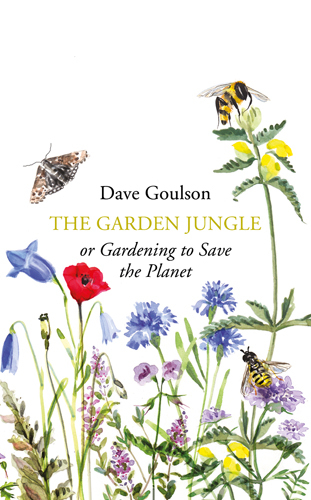 This book, The Garden Jungle by Dave Goulson, is about exactly that: the wildlife that lives right under our noses, in our gardens and parks, between the gaps in the pavement, and in the soil beneath our feet. It is published later in the year and I can’t wait to read it. 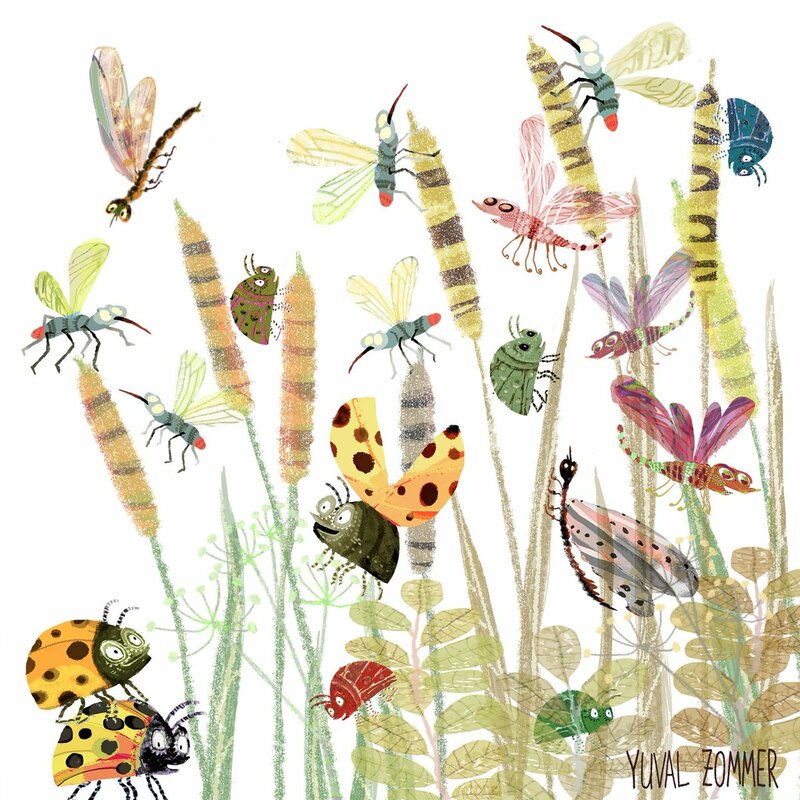 The more minibeasts you know, the more you see, and the more you care about. With climate change we are in danger of a great global biodiversity simplification – losing specialists and gaining generalists. Climate change squeezes the range of animals as they migrate towards the climate they are used to – generally heading north then hitting the end of the range as they run out of habitat. We can make it easier for creatures to move by increasing & joining habitats – all those edges we already mentioned. But the utterly brilliant thing is that increasing our nature by reforesting and rewilding is one of the most effective ways of reducing atmospheric CO2 – nature can be our climate-change crash mat – but it’s also so much more – what an amazing win-win policy using more nature as a solution to our climate problems would be. 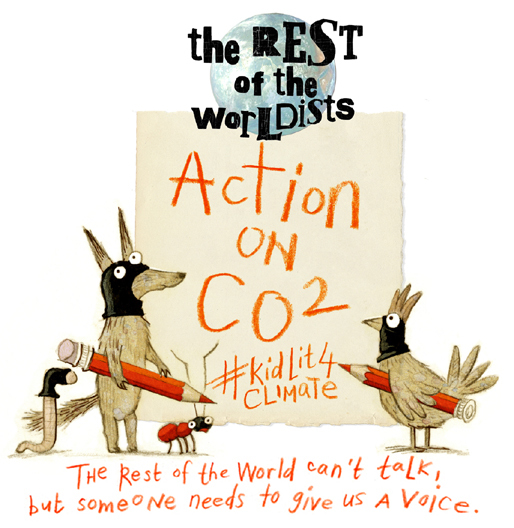 Last week scientists and activists called for action on CO2 through natural climate solutions, through defending, restoring and re-establishing forests, peatlands, mangroves, salt marshes, natural seabeds and other crucial ecosystems. 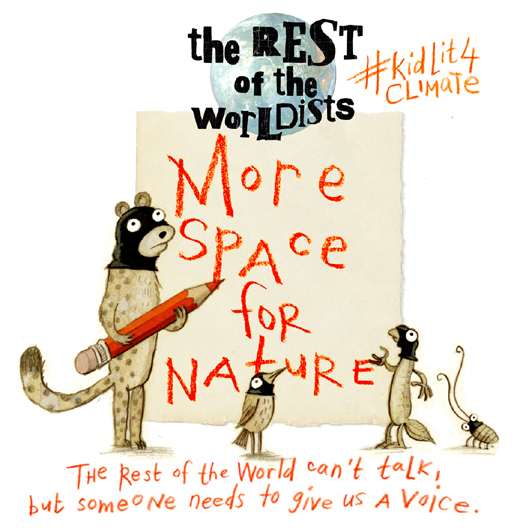 Here George Monbiot explains how to avert Climate catastrophe by rewilding. We also can tackle the carbon dioxide in other ways: at the moment it is essentially free to put CO2 into our atmosphere. This is an enormous injustice and a robbery from young people and future inhabitants of earth. Putting a clear price on carbon would change this. In 2016 John had done a teeny drawing every day for the entire year and they were all on show. 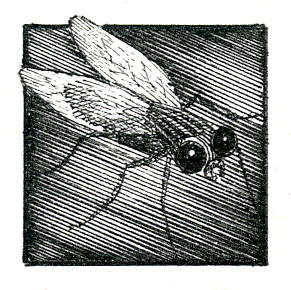 The challenge was to do a teeny (1 inch to 3cm) drawing a day for September. (Here are the winners.) 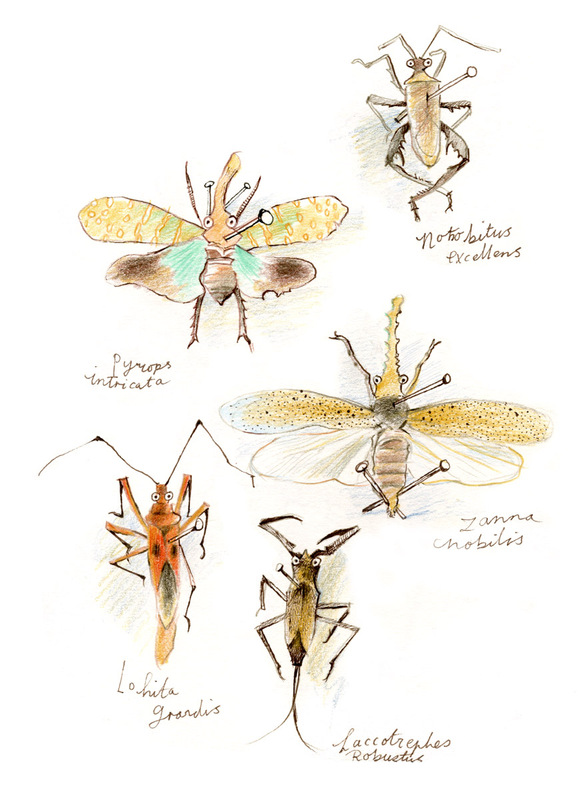 I particularly liked John’s insect drawings, I think partly because they’re life-sized. 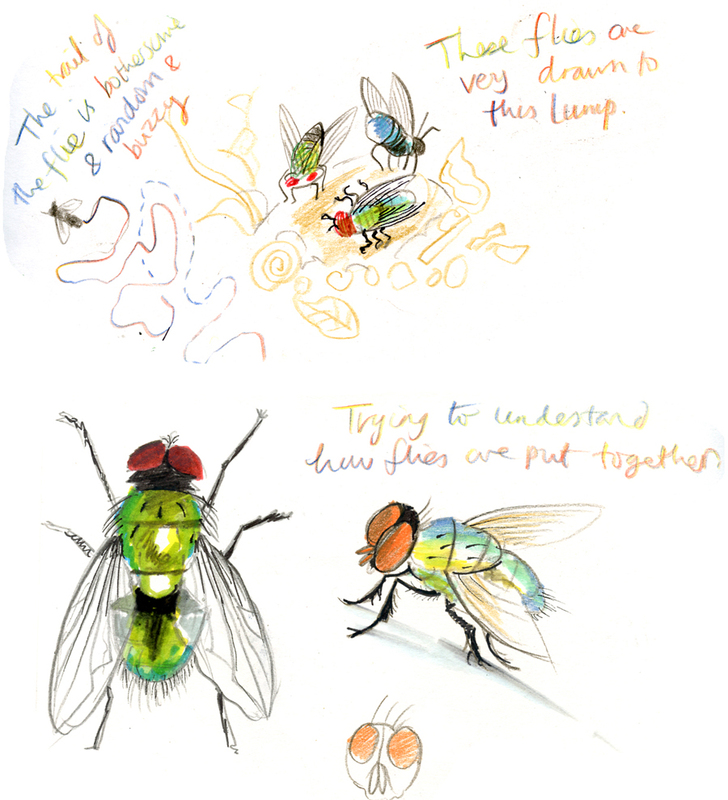 Here are his lovely beetle and fly. 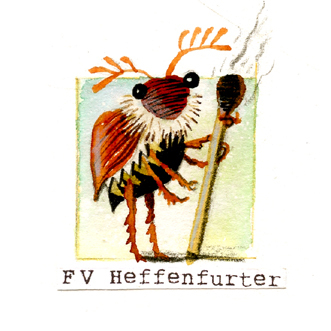 I wondered about doing a month of 3cm square drawings of insects. 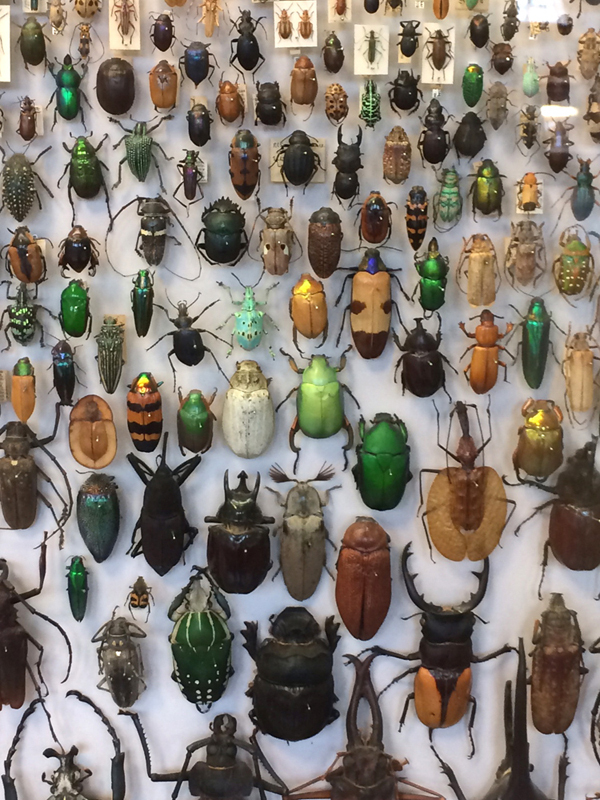 At the Natural History Museum at Tring there’s a wonderful collection of insects in cases. 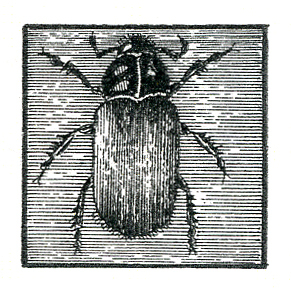 All have been impaled on a pin and labelled, in that classic insect-collecting way. Here are some of my sketches of the Tringsects. I wondered: what if the label, instead of saying ‘Periplaneta Americana’, said ‘Uncle Bert’? 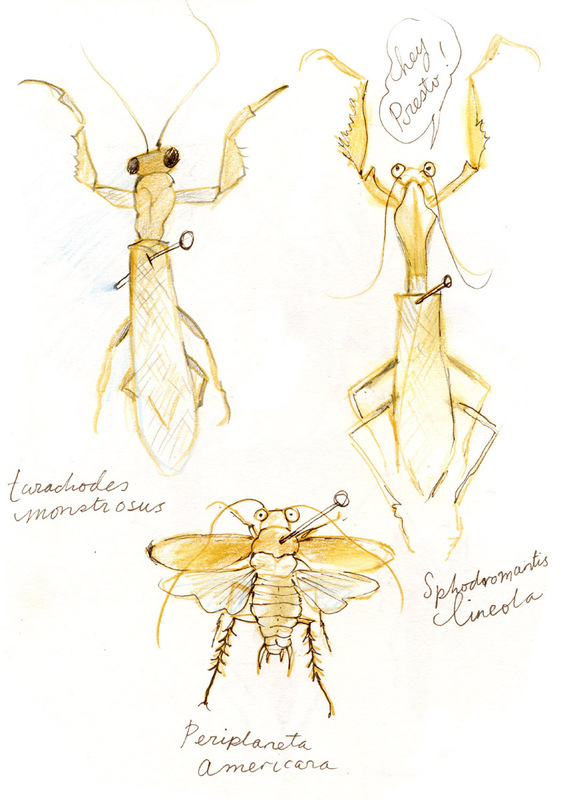 Could the insects start to become individuals you could care about? 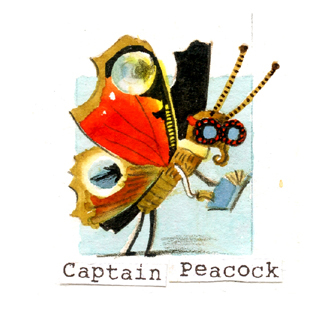 So here are Captain Peacock, Mrs Henderson, Priscilla, FV Heffenfurter and Matilda. And here are all the relatives. 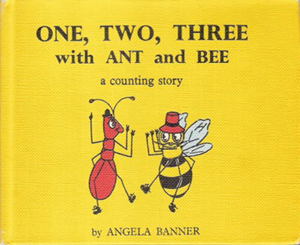 Great and extensive post, thank you for reminding me about Ant and Bee! 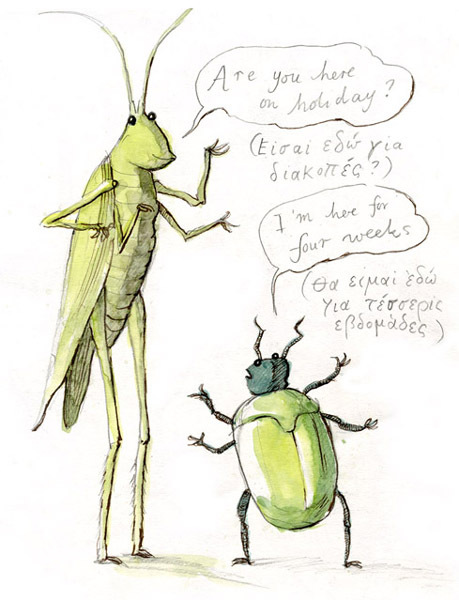 – also love how all the insect drawings, even the earliest ‘historical’ ones have loads of character, as well as your own ‘relatives’. Although I may now worry about upsetting a bee. Very inspiring, thanks!